There are times I wonder whether to dignify certain events with a response. After all, the best way to silence a fool is to ignore his voice. But what if his voice turns into ten voices? What if those ten voices then become 100? Suddenly you find that you are a mouse attempting to speak to the mass of 70 million human souls gathered for the Ardth Kumbh Mela – a Hindu gathering that occurred in 2007. The point is that it is better to hedge the dam before it bursts than to be washed away in the flood. The issue presently at hand is that an increasingly casual use of foul language. While I am loath to mention them specifically, I feel I must do so in order to show that I am not speaking in generalities. The first instance is that of FKH8.com’s use of young girls dropping F-Bombs like a German blitzkrieg in order to highlight the purported abuses of the patriarchy. 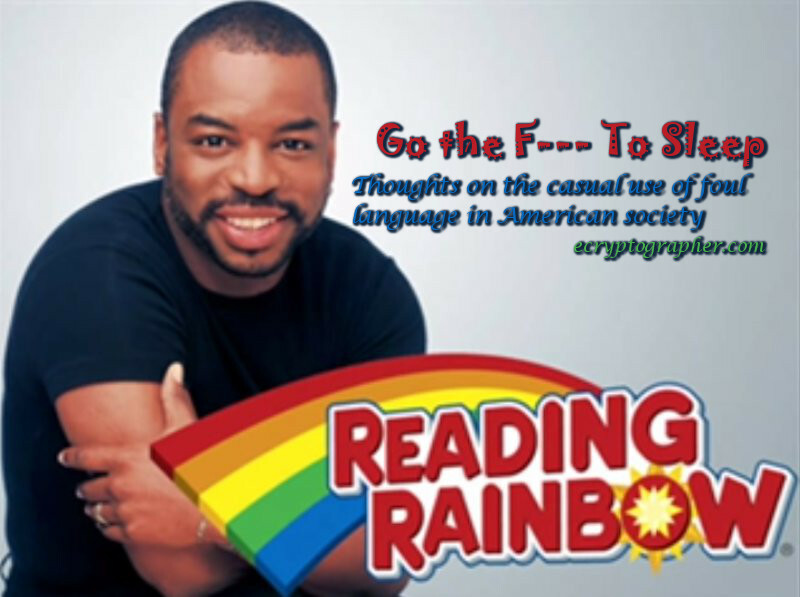 The other is Lavar Burton’s reading of a book titled, “Go the F— To Sleep!” Be warned that if you follow either of these links, your ears will likely be left ringing before the end from F-Bombs. While the first typifies what I would call the Amazonian Feminist with typical flair and thus, is easy enough to dismiss as just more feminist diatribe; the second takes a man who I remember watching with rapt attention as a child and fills his mouth with profanity. The same Lavar Burton that read children’s stories that imparted gems of human decency, the same Lavar Burton that was the engineer hero of the Starship Enterprise, is caustically dropping the F-word. The very man who is at least partially responsible for instilling me with a love of reading is using his talent to peddle garbage. The fist 20 seconds of Lavar’s reading was enough to drop my jaw to the ground in shock and disgust. I couldn’t believe that a group of adults was sitting on the floor as if in kindergarten to hear Lavar read this ‘story.’ I understand that having an infant child can be difficult for the parents who have to deal with irregular sleep patterns and constant wailing from their newborn child. However, I’d think, as the people that are going to raise their own children, that those adults would hold themselves to a higher standard than was portrayed in this video. Let me be clear – the F-word is one that I was raised to think of as one of the most vitriolic words that can be uttered. The use of this word was reserved only for sailors and other such ruffians. It wasn’t a word casually used by a person with any shred of decency within them. Surely, any educated individual could come up with more eloquent ways of expressing himself or herself without this word. I even remember being sent to the principles office for allowing it to cross my lips during a game in P.E. (Physical Education) when I was in middle school. While my adult self can understand that sometimes foul language might be unavoidable, such as when you mistake your thumb for a nail while wielding a hammer, our society seems more tolerant and accepting of such language. Either that, or I am just being exposed to it in places I would not expect, which makes it seem more invasive than it really is. One of these videos used filth only to be provocative to people who hold the word as vile as I do. The other was so casual in its use and even laughed at which left me shaking my head at the childishness of those listening to the reading. Perhaps the heart of the matter is that Lavar Burton is someone that I would never expect to utter such a word. The reality is that my having witnessed only 30 seconds of this video now mars a childhood figure – I couldn’t stomach watching more than that. I couldn’t allow my childhood memory of him be scarred further. Perhaps my own lack of having to raise children of my own has left me naïve of the fact that every parent mutters with their heads under a pillow, “Please, child that I love with all my heart, go the F— to sleep!” I simply have a hard time thinking that if a parent could think that about their child, that it might not one day slip out in an utterance to that child. What a tragedy that would be, and how lucky I am that my parents never said it to me. Regardless, I have to put my voice out there that we adults should be ever vigilant against language that is unbecoming of our years of experience. Let us guard our speech and our thoughts against words that we wouldn’t want our children to utter or hear. Let ours be the generation that such words die out from the English language. Such is my hope.